RON PACE, founder and owner of Canyon Crest K-9 Training Center has been a highly respected dog trainer/instructor since 1977. Often considered a “trainer’s trainer,” author of “Who’s The Boss, a step by step guide for any dog owner that wants to have a better relationship with their dog. He is much sought after for his expertise in helping owners resolve canine behavior including; aggression nuisance barking, jumping up, chewing and much more. Ron has spent years researching the different aspects of dog training and perfecting humane methods of communicating with your dog. Ron has worked as an instructor for the Washington State Police K-9 Association and has provided dogs and training for numerous agencies. He was the first civilian trainer to be contracted to search for narcotics in Washington state schools. Ron has provided trained dogs for TV commercials, music videos and documentaries. Most recently Fox News and JoeTV aired segments on Ron’s training called “Wild About Animals” and WHADUYADO.” Both programs are nationally syndicated. Ron’s successful training methods have been nationally publicized in newspapers and on networks such as CNN, CBS and NBC. He has performed hundreds of demonstrations, entertaining and educating thousands of people. In 2009 he expanded the business by founding Dogabetics, which serves type 1 and 2 diabetics by training medical alert dogs to respond to changes in human blood sugar levels. He was the first to bring service dogs into Washington and Oregon public schools. He received the Local Hero of the Year Award through the Juvenile Diabetics Research Foundation to honor his outstanding contributions to diabetes education and research. In 2010 Ron Pace’s Canyon Crest was awarded The Torch Award by the Better Business Bureau for Western Washington’s Small Business of the Year. He was also the recipient of South Sound Magazine’s 2011 Best Dog Trainer Award. Ron’s CPR rescue of Sugar, the Boxer dog gained worldwide recognition. He was honored to be nominated Hero of the Year by The American Red Cross. It is clear that Ron Pace has not only developed an effective training method but he has been able to impart its effectiveness to others. This ability is what makes him outstanding in the well populated field of dog training experts. Dog owners who learn from his methods can go home and communicate with their dogs as well there as on the training field. This is training that transfers. This is training that can work for you. Ron says, a child grows up needing an education to develop communication skills. Learning how to communicate effectively with a dog in a language it understands is the first step in establishing control. It is important that all breeds of dogs have proper training, and equally important that the owners are properly trained to handle and understand their dog in order to enjoy their pet to its fullest potential. Ron and his wife Patti, run their full-service training facility on five scenic acres in Tacoma, Washington. The center offers a professional trainer/instructor course, breeding of high quality German Shepherds, Boarding and many aspects of Training from Puppy Pre-school to Diabetic Alert Dogs. The business provides customers with pet containment solutions through DogWatch Northwest Hidden Fence Systems. He has served five years as an Executive Board Member for the Tacoma Pierce County Humane Society. Dogs are Great and Ron has dedicated his professional life to making our best friends better! Assisted with forming the first K9 program for the Tacoma and Sumner Police Dept. 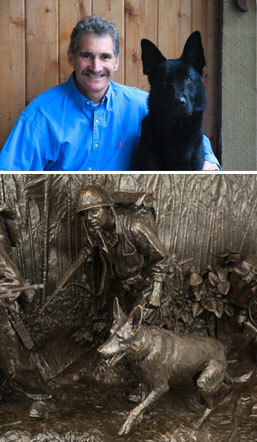 Posed for a sculpturist for a WWII Replica for ‘Soul of the Forward & Faithful’ WWII U.S. Marine Raider Memorial.